Congratulations!! I’ve enjoyed reading your blog, so thanks for sharing your passion, excitement and even your struggles with us. It’s quite inspiring how much you’ve learned over the last six months, you’ve come a long way! Ooh, I love that blouse pattern, I loved it when you first made it! And if I won the fabric, I’d have my very own Monet skirt for real instead of my knockoff version 🙂 Fingers crossed! Anyways, congrats again and hope you have a fabulous weekend! Congratulations on your sew-iversary! I’ve been sewing, crocheting and crafting since I was a kid but on;y started quilting 6 months ago. I would have to say that quilting is probably my favorite right now. I cannot believe you’ve only been sewing for 6 months! I had assumed you were a long-time quilter who’d just begun dabbling in garment sewing (I knew you were new to that because you’d said so). I’m so impressed!! My favorite crafty hobby is definitely (garment) sewing, although different aspects of it at different times. So please enter me in the garment sewing draw — but if I do win? Please just put me down for that gorgeous fabric and pull a 2nd winner for the patterns, neither will fit and you know I’m trying to purge patterns this year! Congratulations! I can’t wait to see what you do in the next six months. I probably have too many hobbies, but sewing is definitely my biggest. I love being able to make my own clothes that cost a ton less then they would in a store, if I was even able to find such cool things in stores haha! I’m so jealous you get to go to the Costume Institute! I’ll need a full report. MONET! 6 months??? Holy moley! My favorite hobby is definitely quilting and also just looking at fabric in general. 🙂 I hope I win your giveaway (not really a garment sewer though, so someone else may have better use for those patterns.) I’m so happy that we are friends. Happy sewiversary! You know…I was lucky to come from a long line of amazing seamstresses…I’m 23 and been sewing for almost 20 years…and I love taking out a piece of fabric and just seeing a garment begging to be cut out and created…:) So, I guess that makes design and sewing my hobby. 🙂 Thanks for the giveaway! fashion history and sewing clothes are my hobby in general. Right now I am really into pattern drafting and taking photos of the lake. And i must say you have accomplished quite a lot in 6 mos! I am responding to your challenge and say that tatting lace IS my hobby, and there are many others like me. You are welcome to visit my blog, http://tatsaway.blogspot.com/ to read more about my tatting. I also sew sometimes but not as much as tatting. Sewing and quilting are by far my favorite hobbies. Like everyone else, I’m surprised to hear that you have only been sewing for 6 months! That’s crazy! Your projects really look like you’ve been sewing for years. hi monet! i totally thought it was your blogiversary or something but wow, 6 months of sewing! you have come so far, i can’t believe it. i still remember when you used to knit. 😉 anyway, congrats on all your success. when you are a famous designer some day i will say i knew you back when! hopefully we can meet up soon! I am really impressed that you’ve only been sewing for six months! I just now realized (as I was thinking about my favorite hobby) that I’m really impressed by your willingness to trash projects. I mean, I know you probably don’t do it easily, but I do see that you do. I think not being willing to do so really cuts into my enjoyment of sewing and I’m resolving right now that let go a little bit. OK, now that I’ve got that out of my system, my favorite hobby is quilting but I really love making bags and I’m hoping to get more into garment making (so far I mostly like making skirts and children’s dresses). Monet…my jaw just dropped. 6 months? Are you KIDDING ME?!?!? You are definitely an inspiration! You tackle things that I wouldn’t dream of being able to sew & I’ve been sewing for 3+ years!!!! Congrats on your sew-iversary!!! Since quilting is my job, my favorite hobby is cross stitching because it’s SO relaxing and addicting and recently I’ve gotten more into art journaling…which you should do to document the days leading up to your next sew-iversary! <3! I can’t believe it’s only been 6 months! I am so impressed and excited for you. 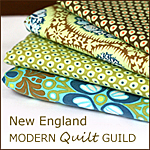 You’ve done some great work and have literally made life better for lots of people in being able to connect us to other modern quilters within the New England area. See you soon!